Here's a classic leather chair that I'm considering. Do I really want a Pottery Barn chair? If it's comfortable and looks good, yes! Now Todd dear, this one looks like it came from a back street Chiropodists office. How about a Louis XIV Fautille in a simple flowered damask. Now this one is one that I would want to spend some time in. I do agree it is a bit Pottery Barn but if it is comfortable, it's a classic look. I do like this one better than the last. I like the previous chair's clean lines but if a chair isn't comfortable to sit in and read a good book... it's of little use to me. This one looks fit for a good novel and a snifter of bran... I mean Iced Tea. I like this one better because it's more cozy. I liked the last chair, but I'd buy this one. Much more comfortable and inviting. 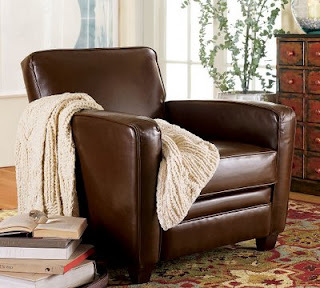 Good book-reading chair.